Gold and silver, as well as platinum and palladium, have been popular vehicles for personal and national wealth protection. Today, a number of factors have contributed to increasing demand for gold, silver, platinum, and palladium coins. When markets stumble, safe-haven metal prices tend to rise and push more investors toward gold and silver to protect their wealth. Conversely, when markets recover and prices dip new investors and collectors enter the market as prices fall, making products more affordable for all. At the same time, geopolitical factors play a role as well. Upheaval and unexpected events often turn the market on its head, such as the events of Brexit sending prices sky high or the surprise results of the 2016 US Presidential election having the opposite impact on precious metals compared to predictions. 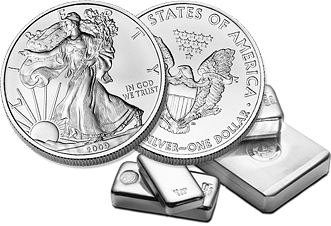 Silver.com offers silver bars, rounds, and coins from countries across the globe. Below you can learn more about the Silver Ukrainian Coins available from the National Bank of Ukraine in the Silver.com online portfolio. The Ukrainian Archangel Michael series of silver and gold coins debuted in 2011, and has quickly expanded in size and increased in diversity as more numismatists discover this relative newcomer in the marketplace. The program started off with just a 1 oz silver coin and two weights available in gold, but has grown to include a total of four gold coins to go along with the 1 oz silver coin. All of the coins in the release share the same design themes, which are not changed from year to year. Similar to other coin programs, you will find the same obverse and reverse design each year and the image is unchanged from silver to gold, unlike coins such as the American Eagle collection or Lunar Series II from Perth Mint. 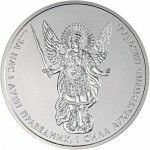 Silver Ukrainian Coins are known as the Ukrainian Archangel Michael collection, and they feature the image of the Archangel Michael from the Christian bible. Known around the world, he is of particular importance to the Christian people of Ukraine, hence is appearance on the official bullion coin of the nation. As it pertains to Ukraine, the Western world knows the archangel predominantly as Michael, but other cultures around the world know him by many different names; from Saint Michael to Taxiarch Archangel Michael. To the Ukrainian people, the archangel Michael is a protector of the capital city of Kiev and the estate of Ukraine. Michael has been depicted in various reliefs throughout human history. However, there is one portrayal of the Archangel Michael that seems to be pervasive throughout various cultures and religions. The primary depiction used around the Western world shows Michael in a full suit of Roman armor and wielding a flaming sword in his right hand. His figure is often surrounded by a pair of bird-like wings that emanate from his back and the rays of the sun expanding from the background behind his relief. For the Silver Ukrainian Archangel Michael Coin, the image of Michael employs another common design feature of his image, that of Michael standing above a dragon with his sword at hand ready to slay the beast. On the reverse of all Silver Ukrainian Archangel Michael coins you’ll find the coat of arms of Ukraine in the center of the design field. It is surrounded by engravings that are all in the native Cyrillic language, with “National Bank of Ukraine” located above the design set and outside of the octagonal cartouche that frames the coat of arms. On the shield of the coat of arms there is the emblem of the National Bank of Ukraine, a pair of griffins with the hryvnia symbol (Ukrainian monetary weight) between the beasts. The symbolism is meant to represent the beasts as guardians of the nation’s gold reserves. You’ll also find the face value, year of issue, metal content, weight, and purity on this face in Cyrillic, as well. Similar to other silver bullion coin programs available in the precious metals market today, there is only one weight struck in these Silver Ukrainian Coins. 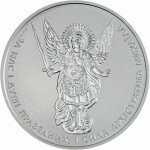 The Archangel Michael coin program features silver and gold bullion options. All coins in the program are available to date only as BU products. Coins in BU condition show no signs of wear and tear, though you may notice minor flaws including breaks in the luster, spotted surfaces, or contact marks from the production process at the mint. Common features of both the gold and Silver Ukrainian Archangel Michael coins include the use of the same obverse and reverse design features annually for the coins. For the Silver Ukrainian Coins in particular, the 1 oz silver coin features .9999 pure silver and bears a face value of 1 (UAH). 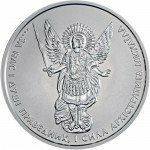 Although it had a low mintage of 10,000 coins in 2011, the Silver Ukrainian Archangel Michael has surpassed 20,000 coins in each of the last three mintage years and often outsells all of its gold counterparts combined. Silver Ukrainian Coins are the official silver bullion coin of the nation, but are just one part of a larger series of coins from the National Bank of Ukraine that includes, as mentioned earlier, four gold coins in total as well. Like other programs, the gold versions of the Silver Ukrainian Coins often move fewer units than silver bullion products. Gold Ukrainian Archangel Michael coins available from Silver.com have been in production at the National Bank of Ukraine as well since 2011. Mintage of these Gold Ukrainian Coins has never surpassed 10,000 coins in any one year for any given weight individually. Collectively, the gold coins have surpassed 20,000 coins in total in recent years, but individual coins are often priced at a point such that most investors cannot afford the coins and the mintage figures remain quite low as a result of low demand. All Silver Ukrainian Coins from the Archangel Michael collection are produced by the National Bank of Ukraine, which has the dual role of producing the nation’s currency and implementing its monetary policy, as well as striking bullion coins for investment purposes. Located in the national capital city of Kiev, the National Bank of Ukraine was formed in 1992 following the fall and separate of the states within the Soviet Union. Originally serving as a central bank for the region during Soviet occupation, the bank today serves the independent Ukrainian government in the production of paper currency and coinage for circulation, as well as commemorative precious metals. At Silver.com we make it easy for you to purchase the Silver Ukrainian Coins you want from our catalog. Silver.com proudly accepts Visa and MasterCard credit and debit cards, with no minimum purchase price and a maximum of $5,000. PayPal fund transfers are our latest offering. In addition to a $0 minimum and a $60,000 maximum, PayPal transactions process instantly and enter the shipping queue immediately. Paper check payments have a similar $0 minimum and a $40,000 maximum, and while they take four to six business days to process, you’ll enjoy a 4% savings on your purchase price compared to credit/debit payments and PayPal transfers. If you have any questions about Silver Ukrainian Coins, payment methods, or shipping options, please feel free to contact a Silver.com associate. Our team members are available on the phone during regular business hours at 888-989-7223, online using our website’s hosted live chat, or by submitting your questions to us in writing via email.